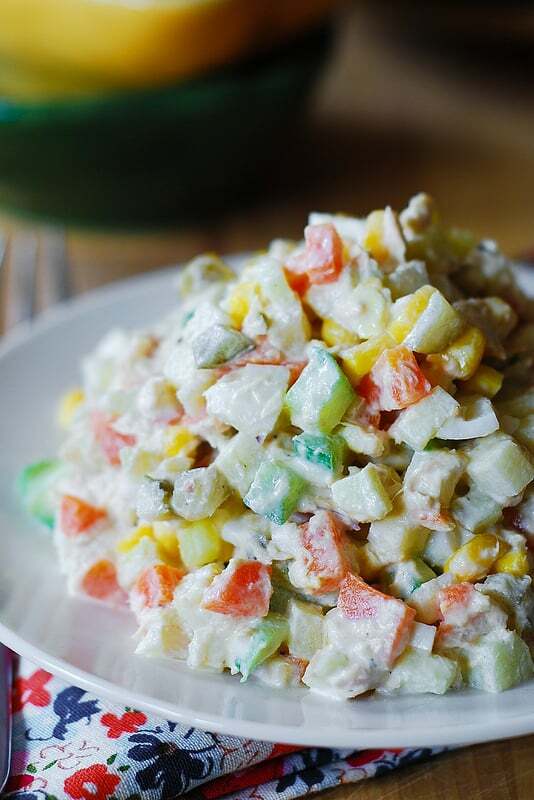 Olivier Salad – Russian Potato Salad with Tuna, eggs, onions, pickles, cucumbers, corn, green peas, and fresh dill. 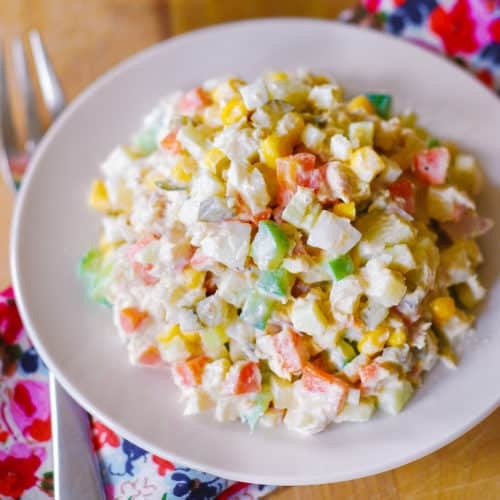 Olivier Salad is a traditional Russian potato salad made with cooked potatoes, cooked carrots, eggs, pickles, green peas, diced ham or chicken. The mayo combined with mustard is usually used as a salad dressing. My version of Olivier salad uses tuna instead of ham or chicken. The addition of ingredients like cucumber, dill and tuna makes this salad exceptionally fresh! And, all the flavors work really well together! This salad keeps well refrigerated for several days and only gets better the next day, as all the ingredients mingle together into a real comfort food! Make sure that all the ingredients are finely chopped. That way, you can get EVERYTHING (potatoes, eggs, peas, cucumber, pickles, carrots, corn) – in ONE BITE! If you like your potato salad to have more “bang” to it, try adding more finely chopped pickles after you mixed everything. When adding mayo to the salad, you can use smaller amount of mayo than the recipe calls for as the salad gets moister as it sits. This salad is a great way to use any leftover cooked meat: chicken, turkey, beef, ham is a popular choice. Or, omit meat altogether to make it vegetarian! 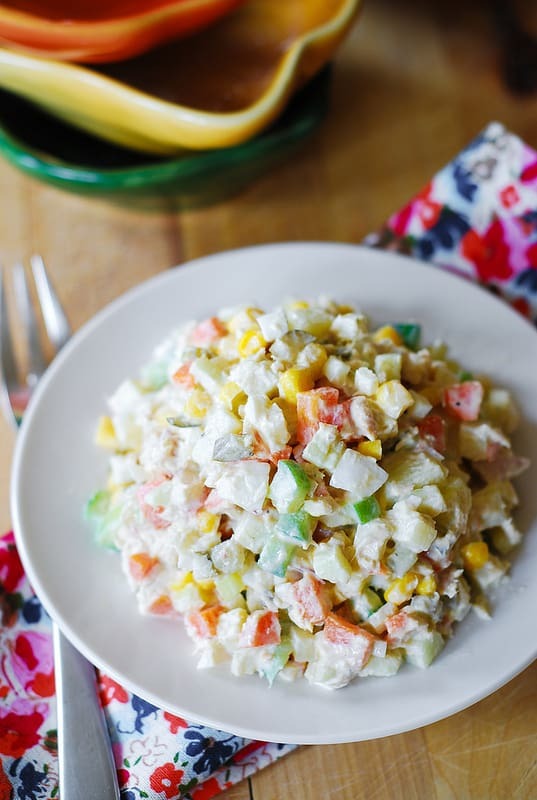 This potato salad is one of the most famous Russian recipes, also known as Olivier salad. 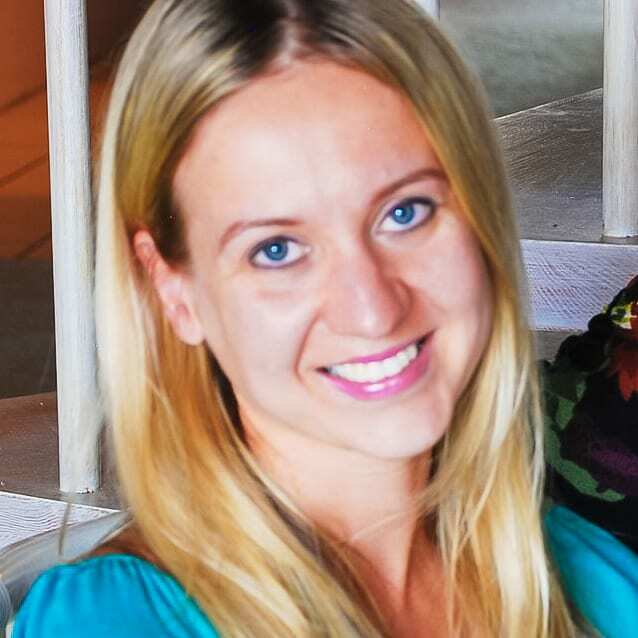 The salad was actually created by a very popular Belgian chef with the last name of Olivier for his upscale and super popular Moscow restaurant in the late 1800’s. Chef Olivier would create everything for this salad from scratch, including mayo (I’m pretty sure you couldn’t buy store-bought mayo back then :)). I have to credit my friend for giving me an idea to use tuna in this salad – it’s really good here and a lighter version of a regular Olivier salad. Enjoy! 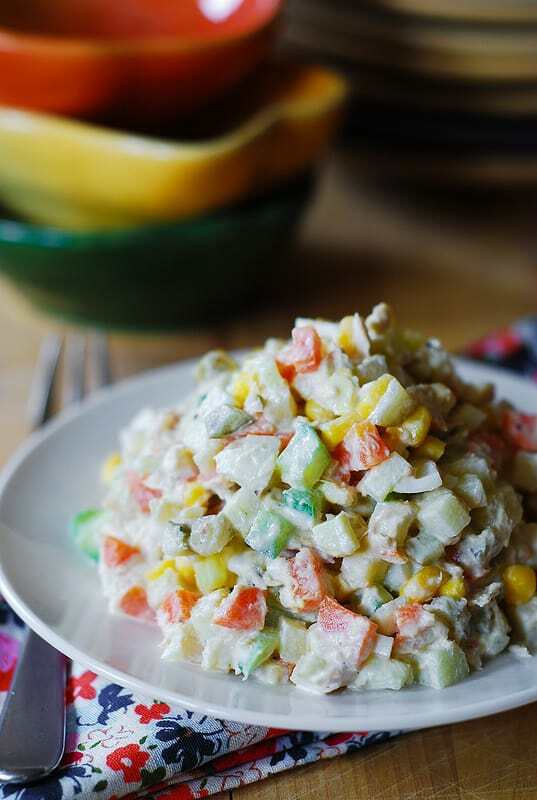 In addition to regular potato salad ingredients (potatoes, eggs, mayonnaise) this Olivier salad recipe uses some nice extras: fresh peas (well, frozen, but thawed and cooked), fresh cucumber, a little bit of pickles, cooked carrots, corn, and a touch of dill! Finely dice potatoes, carrots, eggs, onion, pickles, cucumbers into very small cubes. Cook frozen peas in boiling water, according to package instructions. (should take you just a couple of minutes) – drain of all water and pat dry. Shred tuna finely or dice it finely. Combine all these ingredients, including yellow corn, in a large bowl, add mayo and mix to combine, carefully stirring the salad so that the ingredients are evenly coated, and making sure that all ingredients stay whole. Do not add all of mayo at once – add as much as you need. Season with salt and pepper, dill. Keep in mind that the salad get moister as it sits – another good reason not to add too much mayo but just enough to coat the ingredients. The salad gets even better the next day. I find it interesting that you say this salad originates in Russia. Though it’s called Russian Salad in Spain, the facts are that: potatoes were brought back to Europe from South America by the Spaniards, Mayonnaise is from the town of Mayon also in Spain, peppers green, red, paprika etc were also brought back to Europe by the Spaniards whom also have a high culinary expertise. Neither do you find any members of the Tuna family in Russian waters. Digging into the historic background of this recipe, you will actually find that it comes from the Basque Country of Spain. My family is a Basque on both sides with Italian and French. The information you presented though nice is indeed historically, culturally and geographically incorrect. My apologies if I have upset or embarrassed you. Not my intention, only the facts.